Watch your favourite video songs and movies in video player. It supports MPEG4, H.263, H.264, WMV, 3GPP, RealVideo 7, RealVideo 8, RealVideo 9, RealVideo 10, Flash Video file types. Listen to your favourite songs in music player. It supports MP3, AAC, AAC+, eAAC+, WMA, WAV, RealAudio 7, RealAudio 8, RealAudio 10, M4A (Apple lossless), AMR, etc. file types. The weight is too heavy considering the screen size (2.4 in). Back in the day, smartphones were expensive and most of the people who could afford them were the corporate type. So smartphones got better at better at handling business tasks. Low price for an unlocked smartphone. A phone for work and play &ndash; does it deliver the best of both worlds? 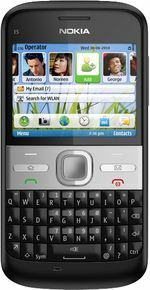 The Nokia E5 is not a great looking handset, and it certainly doesn't have the wow factor that the E72 has in our eyes. And with a largely plastic chassis, bolstered by a metal backplate, it might not be all that robust. one of the most common sense phones ever developed. nokia would still be in the mobile manufacturing business if they had continued with their symbian phones......brilliant. - it has a keypad. - it has unlimited phone book memory. - it has a robust easy menu. - it has excellent battery life. - it can be dropped as many times as you wish. - reminders are superb, also has a copy option for repeats. - recording option is easy and superb for recording directions etc. - reminder alarm is really loud. can wake the whole house up. - smart phones are like the tail wagging the dog. the nokia E5 just does what you ask. no asking back questions. all the smart phones are cons. Good phone, great job, never say die, just tired. Good build, sturdy, has taken many a fall (touch wood) without any glitches. I have used it for 4 years, it was an ideal smartphone of its time, triband wcdma with hsdpa & hsupa, therefore 3g enabled. 256mb ram, 250mb usable phone memory, expandable micro sd. Wlan, blue tooth, micro usb, treasure some invaluable moments with my kids with the 5pm camera, 3x zoom, led flash, decent video recording with light, enjoyed new destinations, since i love to drive with EXCELLENT A-GPS with free navigation with voice. Good Email, quick office, adobe, along with buisness had some fun too with shazam, music player, video player, fm, supportes live TV. Its done a great job, Industry may have laid Symbian to rest, but i refuse to write the orbituary, i would say its jus a bit tired as it has aged, the new guys may steal the limelight but this phone was young too, it will cherish a special place in my heart. Hello, i may buy a new phone, but as i write this, i'm sure i'm not in a hurry to rest this one. Mr Shakeel, bangalore, India.